A glorious array of music and movement characterized a worship service at the Camino de Salvación (Way of Salvation) church in southern Quito November 18 as a network of 9 mostly indigenous Ecuadorian Mennonite churches hosted representatives of the Ecuador Partnership. As a new conference, the multicultural network of churches is known as ICME (Iglesia Cristiana Menonita de Ecuador) or Mennonite Christian Church of Ecuador. Leaders presented a slideshow and told the story of their conference’s formation as a Mennonite community of faith. Representatives from the Ecuador partners brought greetings and CPMC conference minister David Boshart preached a sermon, translated by Peter Wigginton. Following the sermon, groups of children, youth, women, and men from various congregations led worship in song, using both Spanish and indigenous languages, accompanied by a variety of musical instruments including pan pipes, electric guitars, a keyboard and drums. A youth group presented a dramatic symbolic enactment of the salvation story from the Garden of Eden to Jesus’ resurrection. Following the service, fellowship continued over a hearty meal of meat, potatoes, salad and fruit. ​Future Partnership collaboration with ICME may include theological education for adults and youth, training for Sunday school teachers, accompaniment in the process of developing leadership for the multicultural conference, and exploration of a formal seminary program for theological education. Left: Guests and hosts gather around the table to share stories of God's work in Ecuador. ​ mantle, which hosts described as signifying leadership. Twenty years ago in November 1998 in Quito, Ecuador, leaders of the Iglesia Cristiana Menonita de Colombia (IMCOL) and the predecessors of Central Plains Mennonite Conference (CPMC) and Mennonite Mission Network recommended forming a partnership. That partnership came alive a little over a year later when César Moya and Patricia Urueña were sent from Colombia to serve in Ecuador. They arrived in January of 2000 to begin work in indigenous theological education, yet by April 2001 also held the first worship service of the Mennonite Church in Quito. One of IMCOL’s contributions to the partnership was a strong sense that the long-term future would depend on developing an Ecuadorian church with a vision for ministry with indigenous people, refugees and others in need. In the early years partnership meetings were long and arduous as there were many decisions to be made and priorities to be set. In contrast, the partnership meeting in November 2018 was a relaxed time of sharing together and seeking to understand how the partnership can be most supportive. The difference can be attributed to the shift from the partnership operating the program in Ecuador, to the partnership supporting the work in Ecuador. The church planted in 2001 now has Ecuadorian leadership and has formed a legal conference in Ecuador (ICAME--Iglesia Christiana Anabautista menonita de Ecuador). The partnership welcomed this change and the Covenant signed in April 2016 committed to "work together in the best ways to support the vision and direction of ICAME," recognizing the value of ICAME making the primary decisions related to the ministry in Ecuador. Ministry with indigenous churches has also taken on new forms. Jane and Jerrell Ross Richer and their family arrived in 2015 to work with indigenous churches in the Eastern rain forest region. Over the past several years indigenous leaders have also visited ICAME and talked about their growing desire for an Anabaptist conference. They were present for the dedication of the ICAME building in February 2018. Considering legal complexities, they formed their own multicultural, primarily indigenous, Mennonite conference Iglesia Cristiana Menonita de Ecuador (ICME). While indigenous leaders of ICME date their Anabaptist theological roots to early Gospel Missionary Union missionaries recruited from Mennonite churches in the 1950s, they developed their Anabaptist convictions primarily through the teaching ministries of partnership personnel. During this visit the partnership had an opportunity to attend a church service at an ICME congregation Camino de Salvación (Way of Salvation) in the southern part of Quito. Honoring the covenant with ICAME, the partnership supports ICAME’s vision, which includes developing a relationship with the new ICME conference. In November these two conferences, along with the older conference on the Coast (IEME--Iglesia Evangélica Menonita del Ecuador) participated together in a workshop on Pastoral Care (caring for those who care for others). As we see these conferences emerge from seeds sown long ago, we are encouraged in thinking about their potential impact in the Ecuadorian context. Hello Central Plains Mennonite Conference! I’m so glad to be settling into my new position of Conference Minister for Christian Formation and Communications Director here at CPMC! I believe that story plays an important role in faith formation. We learn so much about ourselves and one another and God when we tell our stories and hear the stories of others. And so as we get to know each other, I’d like to begin by telling you a bit of my own story. I was born on a Kalona, Iowa pig farm to a farmer and a Family and Consumer Science teacher. Both farming and “home-ec” have informed some of my life-long passions and hobbies. Through most of my school years, it was common knowledge that I was going to be a fashion designer when I grew up. I sewed, I drew, I dreamed of fashion. But those plans began to crumble during my senior year of high school when I began to sense a strange calling to something different. Something very unexpected. During a year off between high school and college, I spent time both as a youth worker at a Catholic retreat center near London, England, and also as a Certified Nurse’s Assistant at a local nursing home. That year taught me that I loved working with both youth and the elderly and that I loved hearing people’s stories, especially their stories of faith. The next fall, I began at Goshen College, majoring in Bible/Religion/Philosophy, with a minor in Anabaptist Studies. During my time at Goshen, I had several internships; one at a camp, one in a congregation, and another as a chaplain in a nursing home. Each of these experiences helped to shape my unexpected calling as a pastor. A calling that took some time to get used to. Even as I knew I was called to pastoral work, I was prepared to wait a few years before attending seminary. But finally, I took the advice of a good friend, who had said, “Why wait? You’d just be waiting around for what you know you should do.” The next fall I began at Anabaptist Mennonite Biblical Seminary. At AMBS, I learned a lot and had even more internships, including one at Washington Mennonite Church in Washington, Iowa, which led to a pastoral position 15 months later. For the next 7 years, I pastored at Washington Mennonite, for a time as co-, then as lead, and finally as solo-pastor. I learned a great deal about myself, about the church, and certainly about God. I am forever thankful to WMC for encouraging my preaching, for being open to try new things, and for helping me to explore what Christian Formation within a congregation could look like. I loved my time at WMC. Even so, after a time, I again felt a call to move into something new and unexpected. And again, it took some prompting--and some courage. The rest, as they say, is history—here I am. Somewhere along the way, I preached a fateful sermon at Pleasant View Mennonite Church, and 3 years later, ended up with a husband. Jon and I live on a dairy farm near Mt. Pleasant, Iowa, with a herd of cows, 12 laying hens, and two hyper puppies. One of my pastoral passions includes finding ways to be a bridge between the urban/academic Mennonites of my school days and more rural Mennonite communities, like the one I grew up in—and so, I’m happy to be living where I never thought I’d be, back on a farm in rural Iowa. I am excited to be here, getting started in this new role, looking ahead to the ways that Christian Formation can grow as our world and the church are changing. I hope to be and to provide valuable faith formation resources for children, youth and adults in this conference of diverse congregations and to continue the work of communicating the mission of CPMC effectively. As we get to know one another, I hope to hear many of your stories, and to tell you more of my own. If you find yourself in Kalona, feel free to stop by the office and chat, or send me an email or give me a call. I’d love to hear from you! Living out what they believe: Quito church offers refugees "baskets of love"
Various scenes from distribution day at Quito Mennonite Church's Refugees Project. On a Friday morning at Quito Mennonite Church, the ground floor of the multi-story building is alive with activity. It is distribution day for the church’s “Proyecto con Personas Refugiadas” or Refugees Project. Parents, waiting to pick up “baskets of love” (food and essential supplies), watch their children at play in the entryway. Inside the big room that serves as the church sanctuary on Sundays, volunteers measure out portions of food bought in bulk. Next to them are trays of brown eggs, bags of fresh carrots, and sacks of oatmeal. Next to the drums in the area where the praise team usually leads music are colorful plastic bags already filled and ready. Inside, depending on the needs of the family for whom the bag was prepared, are brown sugar, meat tins, maize flour, rice, oil, milk powder and beans. At tables set up in the center of the room, mothers and fathers with babies receive infant essentials—cloth diapers, diaper covers, and washcloths made from soft t-shirt material. A young couple watches as Delicia Bravo, a worker from Mission Network, demonstrates how to use this more frugal, eco-friendly alternative to disposables, folding the cloth diapers to fit inside the waterproof diaper cover. Some of the diaper covers had been completed just that morning, snaps affixed with a special tool. The diaper covers are made from an array of patterned fabric--scraps and discontinued patterns donated by a manufacturer—polka dots, stripes, snowflakes, tractors, and an outer-space design, cut and sewn with rows of snaps arranged to accommodate a growing baby’s bottom. Down the hall is the project’s office. A peek inside reveals a stack of cotton blankets, which the project has paid refugee women to sew from bolts of blanket material--both the blankets and the work being a help to refugees who arrive with few possessions. This scene at a distribution day last November highlights the growth of Quito Mennonite Church’s refugee project, which developed out of a compassionate ministry to refugees fleeing violence in neighboring Colombia, and which has matured over time. The capacity of the program has expanded, serving 7800 individuals in 2018, up from 800 in 2014. Families and individuals seeking refuge in Ecuador nowadays come from many places including Venezuela, Syria, Yemen, and Congo. With accumulated experience, funding assistance from MCC, and access to expertise and services through a network of agencies, the church continues to respond to refugee needs as an expression of faith. Daniela Sanchez serves as the program coordinator along with Alexandra Meneses, who is also the psychologist for the project. Alba Silva provides logistical and administrative support. All three are also deeply involved in church leadership. Refugees, who often come to the project traumatized as well as in search of help with basic necessities, receive an invitation to spiritual and community support as they are welcomed to fellowship with the Quito Mennonite Church during their sojourns in Ecuador. During the weekend following this distribution day, refugees were among the church’s worshippers, on the praise team, and in the kitchen preparing meals and snacks. Support in the form of prayer and helping hands from brothers and sisters in Central Plains Mennonite Conference and the larger church are appreciated. A work team from Central Plains Mennonite Conference led by Doyle Roth in early 2018 made building improvements. Young volunteers from Journey International, a Mission Network internship program, and YAMEN, an exchange program shared by Mennonite Central Committee and Mennonite World Conference, contribute valued time and talent to the project. Project coordinator Daniela Sanchez recently shared a dream to train youth in the congregation—many of whom are themselves refugees—to provide services for the ministry. Might this be a role for a volunteer from MMN or CPMC to fill in cooperation with project leaders? As members of the Ecuador Partnership, we can rejoice in the maturing of this compassionate ministry, pray for the wellbeing of its workers and the people it serves and, as modelled by our Quito brothers and sisters, remain open to what it means to live out what we believe. What’s in your basket of love? Ry Siggelkow was ordained on September 30, 2018 at Faith Mennonite Church in Minneapolis, Minnesota. Amanda (Beachy) Bleichty resigned as pastor at Washington Mennonite Church in Washington, Iowa effective December 31, 2018. Amanda began her new position as Conference Minister for Christian Formation and Communications Director with Central Plains Mennonite Conference on January 2, 2019. Scott Roser completed his term as interim pastor at Zion Mennonite in Donnellson, Iowa on January 13, 2019. Suzanne Ford was installed as pastor at Zion Mennonite, Donnellson, Iowa on January 27, 2019. James Voth announced his retirement and will conclude his role as pastor at Bethesday Mennonite Church in Henderson, Nebraska on March 31, 2019. I have heard it said that "life is what happens when you are busy making other plans." So often I feel like I'm so busy making plans that I do miss out on the life that is happening right now. I'm sure I'm not the only one. Women's Retreat is a time and place to stop, slow down, and set aside the calendar and the schedule(s). On September 15-16, I was challenged to "enjoy the process." Sometimes the process is where we find joy and meaning and the product or the end result is of little value or significance. 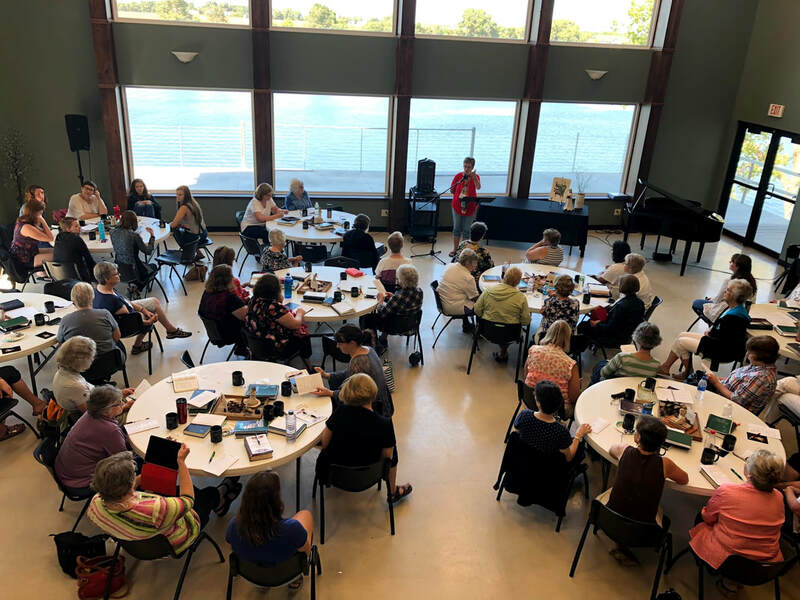 Our guest speaker, Heather Goertzen, spoke candidly with us about the historical and cultural facts surrounding the life of Mary, the mother of Jesus. She asked us obvious questions that we often miss and challenged us to look at this familiar story with fresh eyes and hear it with new ears. Women's Retreat is many things to many women; rest, relaxation, learning, studying, socializing, eating, singing, sleeping, exploring. These are the things we look forward to that nourish our souls and replenish our spirits. I relish the chance to retreat for an entire weekend. Swan Lake Christian Camp hosts the annual Women's Retreat in their newly completed Retreat Center. We leave the cabins for kids and enjoy the comfortable rooms with unique and charming decorations. The camp staff takes care of our daily needs. Meals and snacks are provided; Mary uses tired and true camp recipes that are proven crowd pleasers and leave us more than satisfied. In addition to good food, relaxation and worship, on Saturday afternoon we were offered many process-driven activities to choose from. Guided sessions included an Anabaptist Prayer Service, marbling, and making puff pastry. Other activities and options are also always available; trails for hiking, benches for sitting, kayaks and canoes for floating, beds for napping, and puzzles, games, tabes and chairs for visiting. At women's retreat, there is something for every personality--those who are adventurous (or not) and those who are extroverts (or not)! Mark your calendars now. Next fall's Women's Retreat will be held September 21 & 22, 2019 at Swan Lake Christian Camp. As Mennonites, we like to tell stories of peace. We point to the etching of Dirk Willems who helped rescue his pursuer from thin ice. It's important to pass on our stories. Through stories, we nurture each other. Stories inspire the next generation. Where are the stories among us? Where are the Dirk Willems doing crazy acts of love? Do you know someone who has a a story to tell? Is there a time in your life when you faced conflict and found the Spirit opening a door to respond in a love-filled way? Have you witnessed your church stepping out in your community with words of hope and peace? Central Plains Peace and Justice Task Group wants to collect stories of peacemakers throughout Central Plains. We're looking for a wide variety of stories. Peacemaking stories can include interactions across cultural barriers. We want stories about responding to immigration, stories of undoing racism and sexism. Do you know someone or a church community who has responded in healthy ways to abuse? Someone who has stood up for justice in the face of military violence? Is there someone who taught you about the Doctrine of Discovery? Or inspired you to do creation care? We are looking for a variety of peace stories! Share yours with The Peace and Justice Task Group via Jane Yoder-Short at wilmajane17 (at) gmail.com. Cultivating a Habit of Joy is the theme of this year's Annual Leaders Retreat (ALR) planned for March 24-26, 2019 at the Saint Benedict Retreat Center in Schuyler, Nebraska. David Boshart, our Executive Conference Minister will be leading our three retreat sessions. David writes, "The hope of Jesus is that his joy would be in us and that our joy would be made complete. In the face of overwhelming upheaval and division in our social, political and ecclesial environments, our sense of joy and hope can be diminished and we are drawn to cynicism in the face of the world's problems. As people of the resurrection our call is to joy and hope. Joy is a fruit of the Spirit. It is a habit to be cultivated." In our retreat sessions, David will help us reflect on Joyful Imagination: Living in Hope for Complete Joy; Tending our Joy: Living Joyfully in any Circumstance; and Joyful Witness: Exuding Joy in the Holy Spirit. Plan now to attend Annual Leaders Retreat March 24-26 as we explore this theme of JOY through Bible study, interactive engagement with the biblical texts, worship, and conversation. Annual Leaders Retreat is a place for pastors, chaplains and spouses to come together for renewal, resourcing, conversation, building relationships with peers and for finding space to relax and retreat. Annual Leaders Retreat information and for finding space to relax and retreat. Annual Leaders Retreat information and registration materials are posted on our Central Plains Conference website at http://www.centralplainsmc.org/annual-leaders-retreat.html. I hope to see you in Schuyler! Read articles from our latest issue of Scattered Seeds, the Central Plains Mennonite Conference bi-monthly print newsletter.